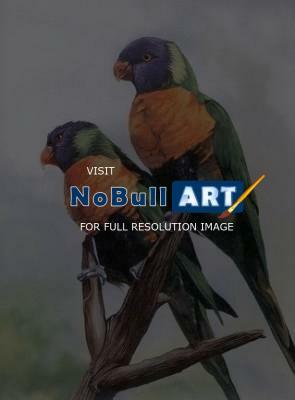 Two Lorikeets on a dead tree branch. This painting shown in the Middle Tennessee Kidney Assoc Art Fund Raiser in 2008. Diane Deason is willing to sell this fantastic piece of art. Beautiful job on the colors Diane! ALL THESE ARE GREAT GREAT GREAT. SO PHOTOGRAPHIC. DETAIL IN EVERY ONE IS MAGNIFICENT. fantastice.i love all of your works.skillfully done. I love birds- beautifully done!